J.G. 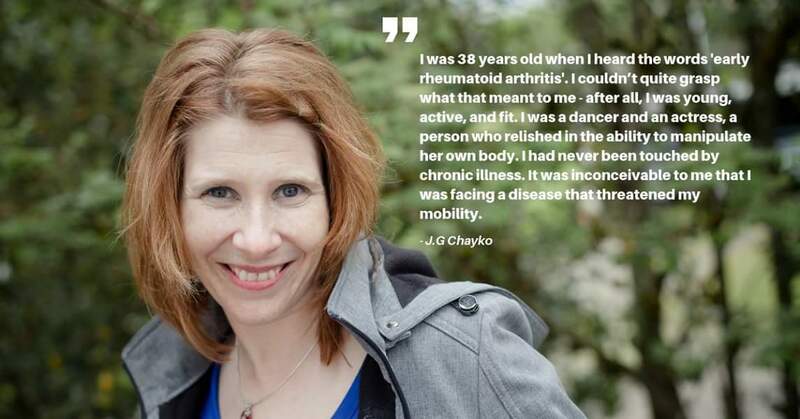 Chayko sharing her story with Arthritis Research Canada for Arthritis Awareness Month. September is the beginning of change – the air is crisper, the morning dew thicker, the lush green leaves of summer mutate into a vibrant burnt orange, the rains return and at night, the wind howls as we snuggle under our blankets. Gone are the idle days of summer, now it’s back to work and back to school. The world around us shifts into a new focus, and people become more attentive. What better time for Arthritis Awareness Month. In September, social media platforms spring to life alongside the changing colors with facts, figures, strategies, medical breakthroughs and new research. All these things are great, but sometimes the average person gets lost in the language of medical terms and scientific phrases, and all the amazing research being done is lost – and so, one way to raise awareness is through personal stories. Stories have always been a part of my life. It made sense for me to write about RA when I was diagnosed. Stories help us discover new ways to manage, and we find comfort in learning we are not alone in our pain. We can connect to a community that understands and supports us. Raising awareness is not just about coping, it’s also about educating. Arthritis is often perceived as black and white, making it difficult for the average person to see it. Our personal stories help strip arthritis from its black and white status and see it as a complex disease that belongs to everyone, not just the elderly. This year, Arthritis Research Canada has created their own campaign of personal stories with #MakeArthritisVisible. There are many types of arthritis (over 100) and that means they are more likely to get lost in the cracks, disappear from our view. Organizations, like CreakyJoints, Arthritis Research Canada and Arthritis Consumer Experts, are constantly working to bring us the latest research, resources, tools and stories so we can live our best life with chronic disease. Through our stories, we can raise awareness, and change the colors of arthritis, to see it not just as black and white, but a kaleidoscope that changes with each person. Our individual experience help lift the bland facts off the page and create a watercolor of life with arthritis. The more vibrant we can make it, the more visible it becomes. For me all progress is a rainbow of color. Seeing only black and white prevents us from moving forward. Thank you J.G. i love the metaphor..